Welcome back everyone to our second comic review of this week. 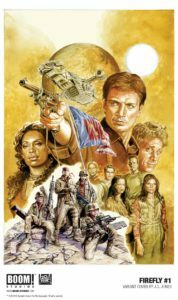 This week we are seeing a very interesting synergy in this second review as we are getting a Firefly comic from the store Bearded Browncoat Comics and Games in Ocala and Gainesville. I mean it just makes sense to do a review on a new Firefly comic for these guys considering their name and how much the Firefly fandom has played into the store and its name. Now be sure to check out their facebook page to find out about their Black Friday ads and the events they have for Friendsgiving get together and the like. Check them out, drop a like and head on over there to give them some love! So we picked up the new Firefly comic and dove right in when we got it home. Trust me if it hadn’t been dark I would have had this devoured before we got home! Right off the bat they have an interesting back and forth between Mal and Wash about why one of Serenity’s engines is on fire. This, in turn, brings in Jayne who because of losing their last bit of money in a card game made it where they could only get knock off parts, which leads him to tell Zoey that whatever’s wrong it wasn’t his fault. This then leads to Kaylee trying to get rid of the fire only to find out that they have to jettison the engine but that’s not working and the manual button for ejecting it is in the fire. So in comes River to shoot the button with one of Jaynes guns. Her brother asks where she got the gun to which she answers “it was in the bathroom, it was lonely”. This leads them to introducing Shepheard Book and Inara who spent this whole time playing cards because they knew that otherwise, they would just be in the way. This was a fun way to introduce everyone on the ship and it worked so well to set the same tone that the TV show had that I loved so much. I spent the first few pages of the comic laughing my head off and hearing the lines in my head in the right voices because they hit the tone so spot on right off the bat. From there we find an old alliance ship suddenly shooting at them which means they have to almost crash land on a nearby planet. To make repairs they find the nearest town and try to find jobs. They find out quickly that the moon/planet they are one is a place where a lot of religious worshippers come to make religious journeys however there are a lot of denominations with differences of opinion on the worshipping that goes one so they end up running as bodyguards for one of these pilgrim groups. They get attacked until the leader of the other group notices that Mal is a brown coat which he also was back in the day. Next thing you know the ship from earlier flies overhead and drops the wanted posters all over that just happen to have Mal and Zoey’s pictures and a bounty for them. I quite enjoyed this comic, it felt a lot like the TV show did and I absolutely adored the show. The writers on this were excellent. Also with the way they were doing this they had flashbacks to things during the Unification Wars which is something they didn’t do as much during the show so it was cool seeing these little snippets of flashbacks. This certainly left me wanting to see what comes next! I am a major Browncoat through and through so what about you? Are you a fan of Firefly and Serenity? Would you like to see more of the show even if it doesn’t have Book or Wash? Do you enjoy seeing further adventures before Serenity in the pages of the comics? Let us know below and remember if you love our stuff and want to support us in bringing you more awesome content be sure to drop by Ko-fi.com/thalra.